I’ve just returned from London Fashion Week, my third time as a member of the press, covering the shows at Fashion Scout and the BFC show space for The Glass Pineapple. It was a total whirlwind, basically running around like a headless chicken for 3 days straight with zero sleep. But as always, it was totally worth it to be immersed in the wonderful world of fashion in the most creative city in the world. Plus, it was a great opportunity to catch up with some friendly faces and network with some inspirational new ones. Throughout fashion week, I was pretty proud of the outfits I managed to pull together at the very last minute - I’ve never been one of those people who can plan their ‘looks’ so far in advance- but my favourite was definitely this all white and cream look. With a grid print boxy knit, cream corduruoy trousers and crisp white heeled boots, this outfit certainly made a statement, but I still needed a pop of colour to avoid my pale skin and blonde hair combo looking completely washed out. This is where my new earrings from Scottish designer-maker Kate Trouw came to the fashion rescue. When I was working at the Craft Scotland Summer Show last month I totally fell in love with Kate Trouw’s delectable, multicoloured polymer clay treasures. So, when she sent me these unusual earrings, you know I had to show them off at LFW (representing Scotland down south, always!) 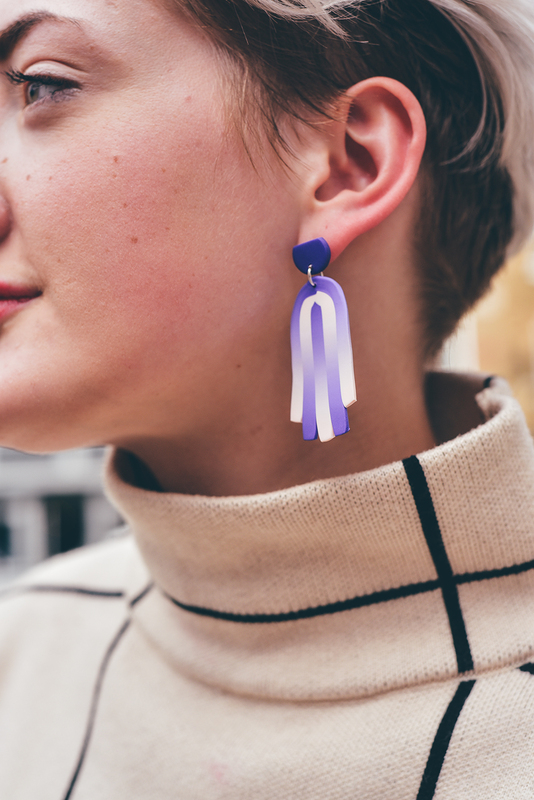 These hand crafted polymer clay earrings are from Kate’s new ‘Tassel’ collection, which takes inspiration from the philosophy of post modern architecture, which borrows shapes and motifs from classical archi tecture and uses them in an abstract and colourful way. Kate Trouw’s covetable jewellery is currently stocked at Tate Modern, the V&A and the new Hayward Gallery shop, as well as various independent retailers and boutiques and at www.katetrouw.com. Be sure to follow her on Instagram too!